The macaroni and cheese box, that is! 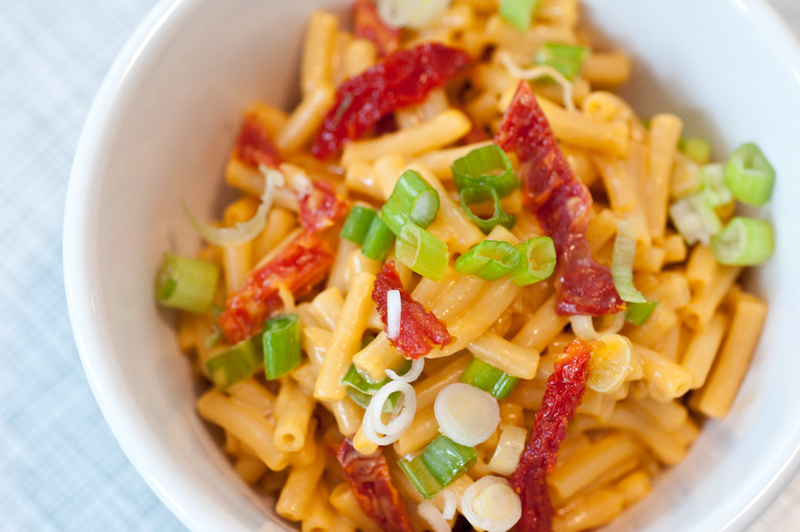 ‘Tis the season for comfort food, and few meals are as comforting as macaroni and cheese. We’re partial to the Blue Box. It’s just so convenient, and the flavors…ah, the nostalgia! Even homemade-food snobs like us enjoy processed foods from time to time. While we certainly prefer whole foods, and fresh flavor whenever possible, our philosophy encompasses all foods. There are times when convenience wins out over fresh, and, surprise, that is OK! Keep in mind the countless reasons we make food choices – sometimes it’s based on taste and comfort and no other reason. It’s being aware of how we make the choice that is important. Of course, it doesn’t hurt to add in nutrients here and there and jazz up the traditional dish. Chop up pre-cooked turkey or chicken sausage, pepperoni or last night’s roasted chicken for an extra dose of protein. Broccoli and peas taste great in boxed mac n’ cheese, but what about steamed soybeans? All of these veggies add extra fiber and nutrients (broccoli – Vitamin C, Vitamin A, Vitamin K, folate, potassium; peas – Vitamin C, Vitamin K, manganese, thiamin). 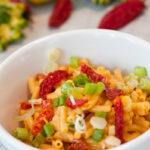 Other add-ins – tomato chunks (or salsa), black beans, corn, onions, bell peppers, or to make the macaroni pictured, add sundried tomatoes and green onions. Even squash and jalapeños can be used to punch up the flavor and spice! To make the dish even better for you, try using 1% or skim milk. We find it difficult to sacrifice real butter for margarine, but if your palate enjoys the flavor, you can save calories and saturated fat. But how’s this for a genius modification: one of our readers, @ehlcreations on Twitter, suggested replacing the milk and butter with plain yogurt. What are your favorite add-ins and modifications to the delicious stuff in the Blue Box? I cut fresh broccoli into big florets, give it a bath in boiling water for a few minutes and then dump it in ice water to stop cooking. Stir that in some prepared blue box mac n’ cheese with lots of freshly ground black pepper. My mom used to make goulash at least once a week with whatever was leftover – peas, green beans, corn, onions, green peppers, etc. She’d mix it with macaroni, ground beef and canned tomatoes, throw the whole thing in a casserole dish, cover it with cheese, and heat it through in the oven. We always gobbled it up. I love the whole idea using leftovers this way. Now I do the same thing for my kids, with vegetarian crumbles in place of the hamburger meat. It’s still a classic. 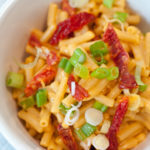 I loved it when my mom would dress up our macaroni and cheese with some veggies or some ground beef. So simple, but always a crowd pleaser when I was kid.